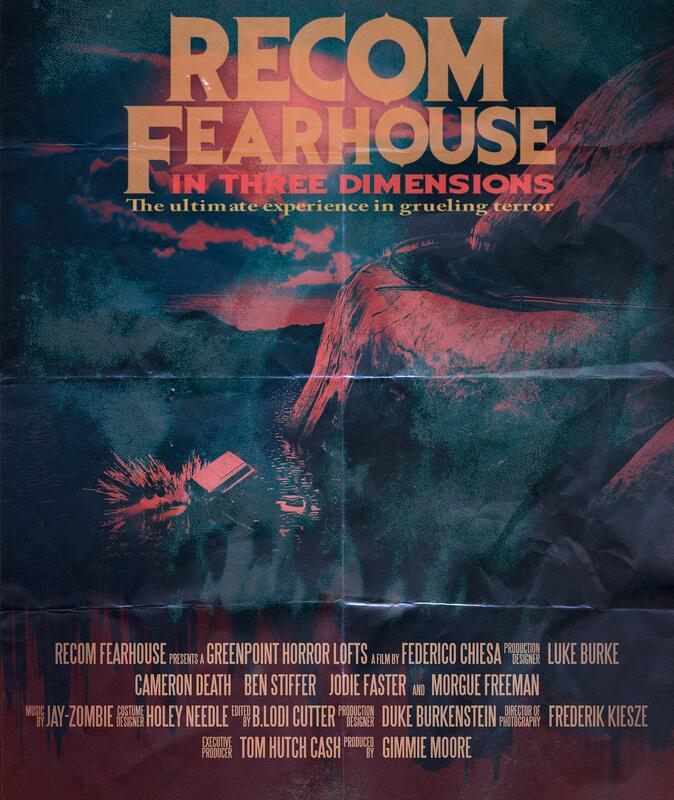 Inspired by the 80s horror movies we love, and particularly by The Evil Dead, we decided it was time for us to star in our own Night of Terror. Of course we’ll need the right vintage of car, complete with wood-effect side panels. Join us as we willingly enter our own world of fear in the Making-of video! 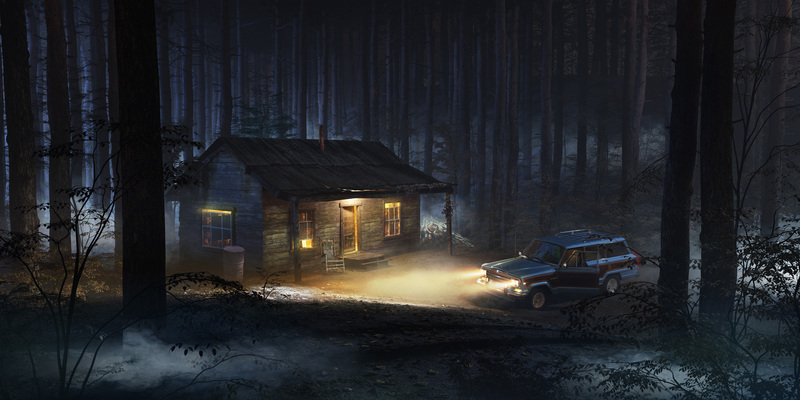 Now we’ll drive together from our small-town American home to a cabin in the woods…what could possibly go wrong? We built our movie-inspired sets in CGI using Maya. We were striving for a cinematic feel to the scene, so the environment is all-important – it becomes a character in the story that we’re telling. With the layout of the shot decided, we added textures, and began work on the lighting. 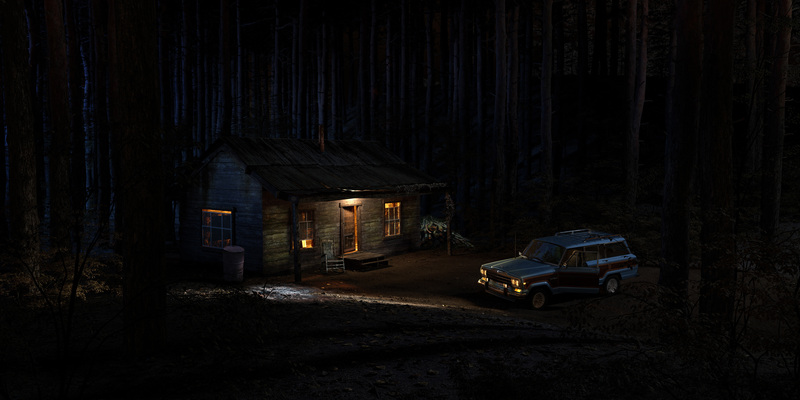 For lighting direction we found a lot of inspiration from the photographer Gregory Crewdson. The exquisite lighting of his elaborately staged photographs, many of them taken at night, create a mood that connects the viewer to the story he is trying to tell. 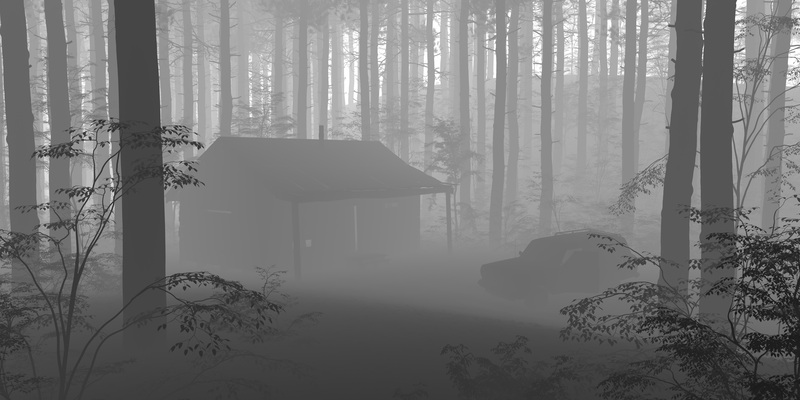 We lit and rendered the scene in Vray and rendered volumetric fog for the desired atmospheric effect. With final adjustments in Photoshop, the scene is set. What will happen to us here? Will we stay together, sensibly turning our finely tuned monitors into security cameras, and using our Wacom styluses to defend ourselves? Or will we inevitably become separated in the forest? …Stay tuned…. This entry was posted in THE MAKING OF and tagged Automotive, halloween, horror, Personal Projects, vintage on October 24, 2017 by recomfarmhousesocial.